Elmenteita Badlands Volcano is located south of Lake Elmenteita in central Kenya. 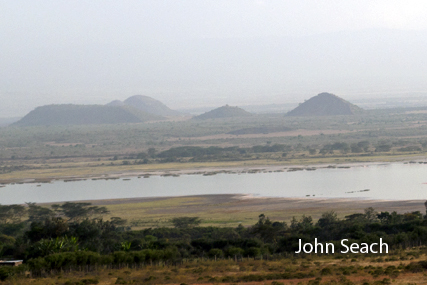 The volcano is located in one of the least stable parts of the Kenyan Rift Valley. (2278 m), and the southern boundary is Mt. Eburru volcano. It is part of a group of volcanoes forming the Kenya Some - Suswa, Longonot, Olkaria, Eburru, Elmenteita, and Menengai. Lemulug cone is located at 0.505 S, 36.245 E, and was erupted between 10,390 and 12,579 years ago. Katerit cone is located at 0.512 S, 36.271 E and was erupted between 9,650 and 11,806 years ago.